So my wife and I decided that it was time for a swimming pool. 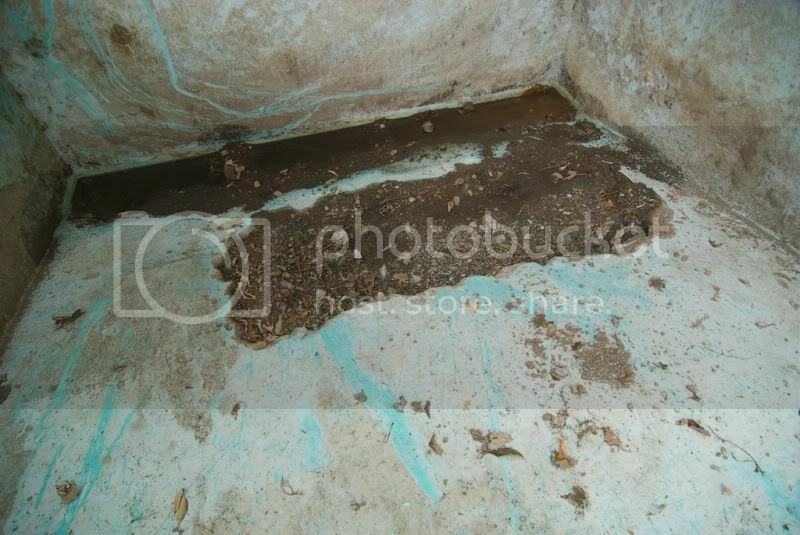 When we had moved in, we noticed and were told that there was a buried inground cement pool in the back yard. They had filled it in with dirt and made a flower bed, but you were still able to see the border of pool which is and inch or two above ground. 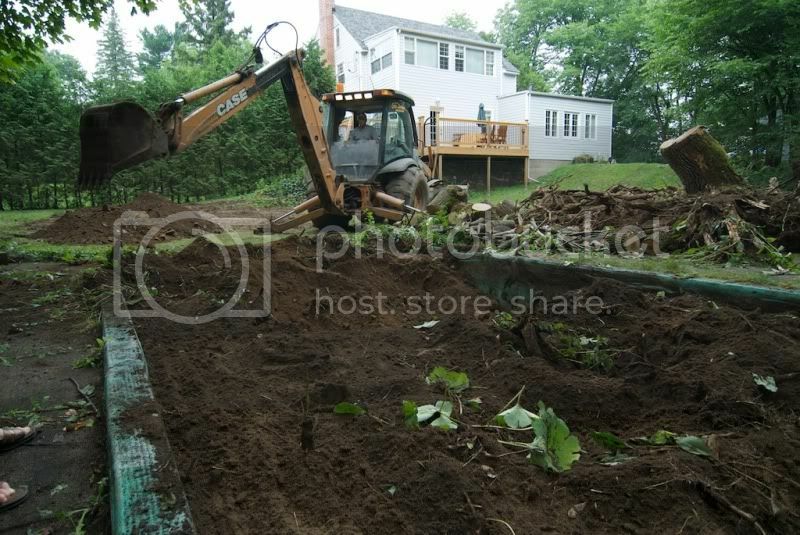 We didn't want to add an above ground pool beside it, so we decided that it was time to dig it up and have it removed and filled in properly. Long story short, we dug out the pool and found it to be in pretty good shape. There is a crack down the side of one of the walls and a rectangular hole that they made in the bottom for drainage, but otherwise it's crack free. We had two pool guys come in and tell us that it's easily fixable and upgradable, for a price. I also decided to get a price from a company that does foundations for houses just to see how the price would differ. Let me tell you, companies aren't too quick with their quotes. Three guys never even got back to me. So I guess I'll have to evaluate the job based on the two that did. This would mean that I would either need to re-use the current functional but rusty looking drain or seal the current drain and go drainless. He would then water blast the pool at 5000lbs waterblast(which I find kind of low), add a new drain within the new cement hole, add a skimmer, a return and paint with two coats of rubber based paint. I have at least 100 questions to ask, but I'll limit this post to the quotes. -Do you think that the foundation guy(who was super nice, confident, professional) is a good choice for this project? or are there pool related issues to this that would require a pool reparation guy? -5000 lbs water blast? will this clean all the paint off? It sounds more like the 4000lbs pressure washer that I can rent for $85 a day and do it myself. - is it really that hard to add a skimmer? does it need to be poured in with the cement? The foundation guy only accounted for a rectangular cut out within his form. No support. - is rubber paint the way to go? I've read a lot on this and I prefer to pay the extra for epoxy. I don't want to be repainting the pool every 2-3 years. I like the idea of 5-7. None of the companies here in Quebec seem to want to do it. One company told me it's because it's too hard to prep for the next time that painting comes around. Anyhow, I don't want to scare anyone off at this point so I'll let it be for the moment. I've added some photos for entertainment value. latest pic, sorry for the delay. 5,000 psi water blast is plenty, but I would not suggest that on that pool. All of the old plaster needs to be removed chances are, as you have no way of knowing how well the plaster is adhered to the concrete shell. The new tie in on the concrete repair is doable, but it looks like it is running through the bond beam. IIRC, you will need to go back 2' and tie in to be structurally sound (I will try and double check that for you). Pool construction does not recognize a cold joint, so it should not be a problem if properly done. It doesn't really look all that bad, and should come out pretty easy. I would ditch all of the "metal" pipe and re-do it in rigid PVC (or whatever you use where you are. It may be flex, which I dislike, but might be correct for your area). Now would be a great time to add more return lines, if you have less than three. I would use 1 1/2" and install the returns at a 90 degree angle to the wall, down about 18", and I would put adjustable eyeball fittings on them to direct the water. I would also loop the entire system around the pool to equalize flow. Don't kid yourself on any "paint" type finishes. You'll be lucky to get 3 years out of them (I've never seen one go two years, in my area). If you can get the pool plastered, that would be the best bet. You should see about ten years out of a plaster finish, and can get upgraded finishes that will last longer. I would sure take a look and see if you can afford to go that route before you decide on "paint". I have to say that I didn't even realise that they plastered cement pools. I thought plaster was for gunite or shot crete. When looking at it, it really looks like thick paint on raw cement, although, what do I know. (the pool guy who was here did say that the chip that I showed him was rubber paint though. So how would I go about removing all the old plaster in order to replaster? Sandblast? What's a bond beam? what's iirc? and what do you mean by going back 2'? For the cleaning, how much better is a 5000lbs waterblaster than a 4000lbs pressure washer? 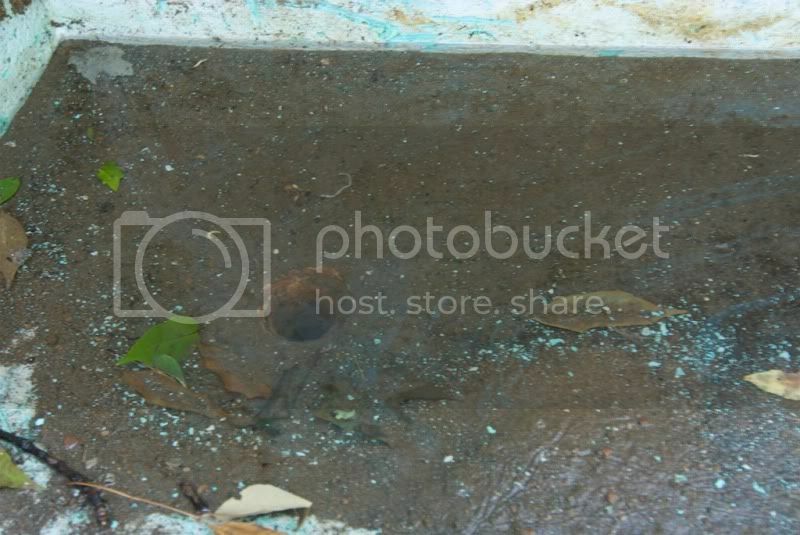 That looks like and old plaster pool (gunite and shotcrete are cement, just formulated for pools, and then plastered typically) with serious copper sulfite damage to me! Easily done with all the copper plumbing that it looks like it has! The bond beam is the structural portion of the pool that runs around the perimeter. There are usually 3 (sometimes 4) number 4 rebar running around to tie it together for structural integrity. The rest of the pool is usually #3 bar (rebar is made in increments of 1/8", so #3 bar is 3/8", #4 bar is 1/2", etc.). Pools are designed to handle the outward pressure of the water, and the bond beam helps to hold it all together at the top. IIRC is If I Remember Correctly. Some times I cheat and use this stuff (don't feel bad, I just learned what YMMV-Your Mileage May Vary-means ). Anytime you cut in to the structure (steel) of a pool, you have to go back onto the bar(s) that you disturbed and pick up the structure again. Sometimes they will call for 10 times the diameter of the rebar you cut, and other times they will call for you to go back 2' onto the bar, or maybe even something other. Many things can affect this, so it is best to check what codes are in your area. I have engineering here and can try and scan and post, but it may not apply in your area (I think I commented on your skimmer in another post, and my structural here should be the same as there for this purpose). I'd see if you could find a guy with specific pool knowledge that will help you (but maybe not suggest "paint"!). This is somewhat specialized, so you don't want someone learning on your project! I will give you as much info as I can, but, again, it may not be real accurate for your location. 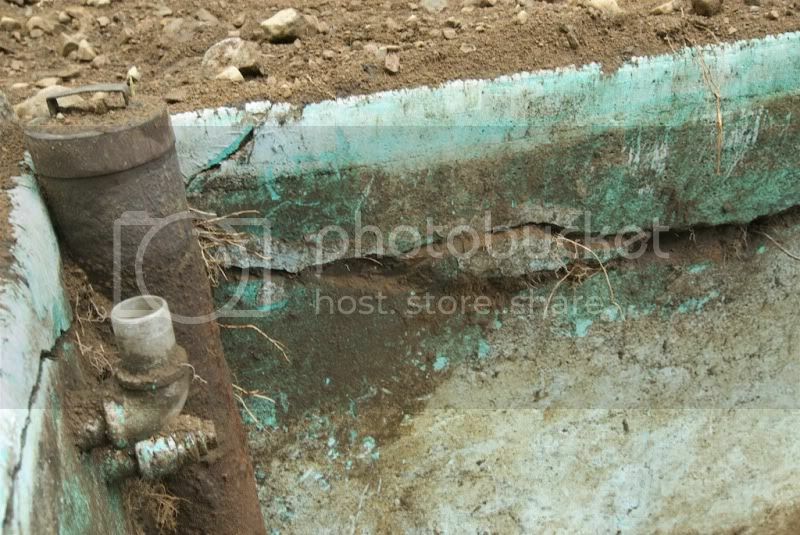 I do know for a fact that my pool was poured, and the pipes you see are all galvanized steel. The big rusty thing you see in the corner was something they placed in it when they back filled it and has nothing to do with the pools plumbing. by going back two feet do you mean drilling 24" holes in the remaining cement and hammering the rebar? God your scaring me now. No, you just need to expose the rebar that far back to tie into (lap joints) it. another photo that I didn't realise wasn't up here. When you talk to them about the repair area, see if you can have them cove (radius) the floor corners as well. It will make for a nicer interior shape and make it better on the plaster company. 90 degree corners are tough to finish! Crickey Bruce! Love your project. If your going to water blast the more pressure the better 6000psi if you can get it. I would take a closer look at your plaster because if it is really rough and pitted you will need to grind it back to get a smooth surface to stop nasties growing in your pool. I'm painting mine and have done just that, but I still need to patch as the plaster was thin in parts, mainly on the floor, ( check how thin your plaster is where the hole was cut out), Grinding the plaster on an old pool is probably false economy. (it's not designed to last forever) I think in your case I would chip it all off and replaster, no need to waterblast. For an extra $4000 to 5000 I am sure you will be happier with the result. 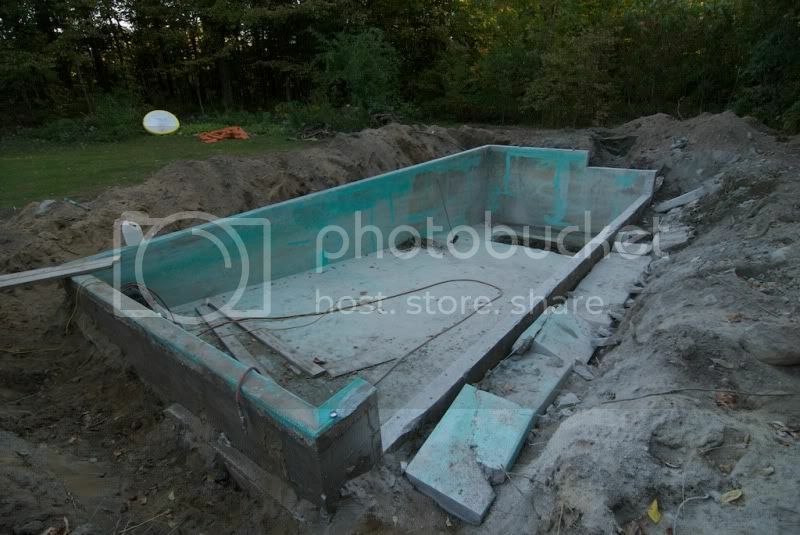 Re plumb and re equip and you will have a new pool. Does it have a deck around the pool? My pool doesn't have plaster on it. It's a poured cement pool from decades ago. You can still see the lateral board marks in the deep end from the wood form. When I cleaned a section down through the paint coats, you see the raw cement. Three pool guys came to see it and none mentioned plaster within their fix/clean/repaint quote. 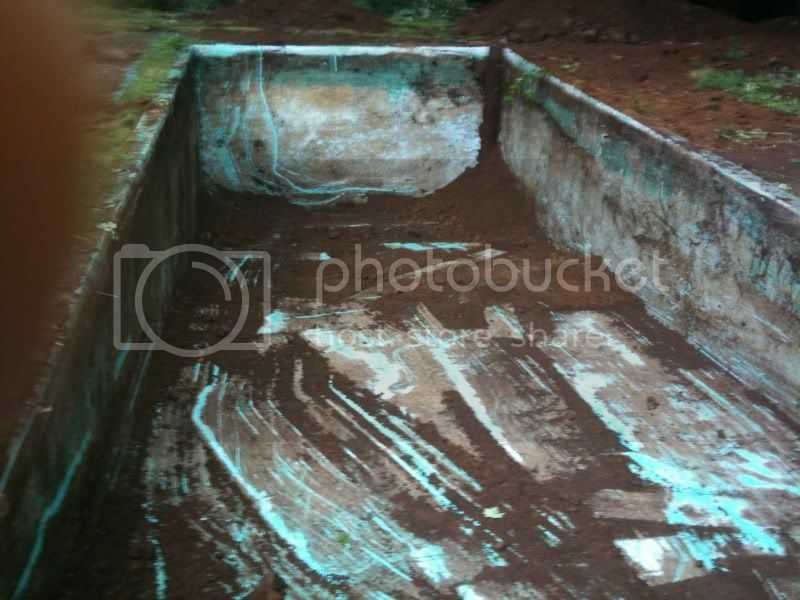 Is it not possible to have a cement pool without plaster? The conventional construction method is to form a concrete shell and finish with several layers of plaster to give a smooth surface and reduce porosity. Iirc porosity can reduce the strength of the concrete shell. A paint finish on a unfinished concrete shell would have a minimum life span. When we shoot pools here, we are allowed to stop one day and start again the next, if needed. An example would be an Olympic pool, which just cannot be shot in a day, so the guys would leave a jagged edge when they stop for the day and pick up where they left off again the next day. That area would be considered a cold joint in some circles, but is allowed in swimming pool construction. It doesn't affect the structural integrity of the pool, so it is allowed. Wow, that is some cut, how long did it take them to do that? Did they use a hydraulic concrete saw? I would ask them to roughen up the joint before finishing the walls. They did real pretty work, but you are asking for a crack if they pour to that clean of a joint. Jagged would be better than smooth. How far apart, and what size, are the rebar? I'd like to see #3 (3/8") bar twelve inches on center, horizontally and vertically, and multiple (3, depending on wall thickness) #4 bar tieing in the top of the wall if I was doing this. I may be able to find another structural detail that I can scan and post if you wish. That's a lot of work, and I'd hate to see you have a failure after all of that. Have to agree with simicrintz on the jagged edge there. From the looks of the holes he drilled for the rebar, it will be #3, 12" apart. Staggard as in the photo. So your saying to chip off the inside 90 edge of the cement? He said that the epoxy that paints on the old surface before pouring will prevent leaking. I was thinking of top coating this wall with a product like Sanitred. It's kind of hard to tell contractors how to do their job and then expect that they'll hold up on their warranty. Photo's are my thing, so there will always be alot. I'm not really sure, my wife was the one here, not me. I presume it was a quickcut, but they had two different formats. The staggered holes don't really do anything different than a straight line, and I'm not sure why he would drill that way. You want to have at least 3" of coverage over the steel, so centering the steel would give the best coverage. The ones closest to the water side of the pool look a little suspect to me. The cut is nice and clean, but the entire surface should be jagged (random elevation and rough). Cement wants to stick to something rougher as opposed to smoother. If the concrete has to move against a jagged surface it is much harder to achieve than moving on a straight line. Remember, the pool is designed to handle the outward pressure of the water, but it is also influenced by any ground movement pushing against it. If that was a free standing wall, with no inward or outward pressure, the straight line pour would probably be fine, but I'd be wary on your pool. Better safe than sorry later! You will obviously need something to waterproof this when you are done, but I would not rely on paint (or any coating, for that matter) to protect against movement. It may "stretch" for a while, but it will fail at some point. After all this work (and expense!) I'd hate to see you experience a crack and a leak! I will grab my engineering later and see if I can post a pic of the structural detail that is typical for pool walls. Hopefully I can get it to you before they tie the steel. It might be worth showing them.